Reflecting on her work in Nora Ephron’s ‘Lucky Guy,’ Golden Globe winner Maura Tierney says co-star – and reputed “nicest guy in Hollywood” – Tom Hanks lives up to his reputation for being the best. Larry King: There weren’t many women in that play? Maura Tierney: No, there’s two of us. Larry King: There’s two right? It’s just a male dominated newsroom. 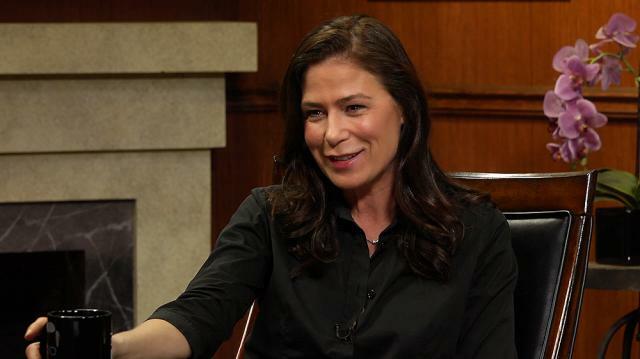 Maura Tierney: Yeah, yes, it was a dude’s play. Dude filled play. But I like being around a lot of guys. It was me and Deedee Lovejoy, we handled it well. And they’re great guys. Larry King: And Tom Hanks is the best. Maura Tierney: He really is the best. It’s sort of like, ‘oh wow.’ You can’t believe that he’s actually really like that. But he really is like that. Larry King: What a good theatre actor he is. Larry King: Did you meet her?